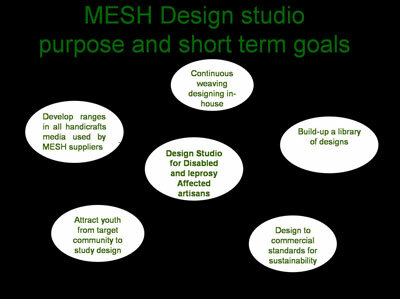 MESH Design Studio opened in February 2008 with financial support from IM Soir, a Swedish Development Organisation committed to Fair Trade. To provide high quality design and product development support as an on-going service of MESH through a design studio. Thereby to allow regular orders and increased economic security to the disabled people that supply MESH. To encourage young people from the target community to undertake appropriate higher education that will enable the groups to do more of their own design work in-house. Conduct 3 skill enhancement/organisation development workshops per year for up to ten people for 5-7 days. Conduct 6 programmes for 2 people for up to 30 days developing specific products (multi media).